Melbourne House Check, we want to say a big ‘Thank You’ for all your assistance with inspecting our town house. The whole process was explained to us clearly, a thorough inspection was conducted and a clear and detailed report was delivered to us within 24 hours. You truly have us ‘peace of mind’. Dear Brad, thanks so much for the excellent inspection and report. I was confident in your findings and am happy to say I was successful in buying this property. Nathan Johnson – the real estate agent from Compton Green, told me he was also impressed with your thoroughness. We engaged Melbourne House Check to conduct two pre purchase house inspections for us in Camberwell. We were very happy with their professionalism and knowledge and were particularly impressed with the way Brad explained the house to us. I would definitely recommend their service to anyone requiring a pre purchase building inspection in Melbourne. 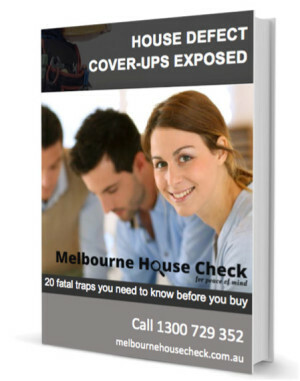 HOUSE DEFECT COVER-UPS EXPOSED BOOKLET – Get your free copy NOW! “A must have document for anyone considering buying a house”. Inside secrets of how vendors may cover-up defects and ways not to get caught out. How to avoid making potentially expensive mistakes when searching for a house. A full procedural inspection checklist for all building and timber pest inspections. Get a property condition report if your new building or renovation project has been completed with unsatisfactory defects. Our building inspectors can inspect the work and prepare a comprehensive and detailed report that documents all major and minor defects. The report in most cases will make recommendations for rectification of defects. We offer the most comprehensive and detailed property inspections guaranteed. Buying a house can be a stressful process. A pre purchase house inspection from a qualified building inspector can help you ease that stress. ‘Cover-ups’ in houses for sale are one of those uncertainties. Our house inspections uncover all the tricks that vendors do to hide defective problems. During a house inspection, a Property Report will identify both major and minor defects in any house. Our building inspections check that the building conforms to the relevant building codes and standards and give specialist advice regarding any major problems. We will identify and report on evidence of timber pest activity and/or damage caused by termites, borers or fungal decay. 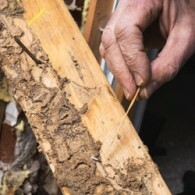 Our termite inspections look for evidence of any previous timber pest problem or conditions that make the property more susceptible to timber pests. For example timbers in contact with the ground and excessive moisture sources, such as leaks from showers and any plumbing defects. Our building inspectors also use the Termatrac T3i to assist us in identifying Termites. The Termatrac T3i is the most advanced termite detection device for property inspections in the world. House inspections are an essential tool pre purchase. 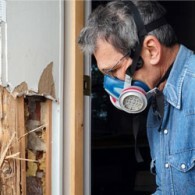 During our house inspections we look for termites, asbestos and defective cover-ups. Our building inspectors are fully registered builders with years of experience and will give you peace of mind. We offer building advice whereby we visit you at your home or office to discuss your specific questions. Whether you are about to undertake a renovation or wish to add an extension on your house, we can assist you with all your questions and concerns. Carbon Monoxide or CO can be deadly. It is an odorless, colorless gas that is omitted from faulty gas appliances. It is important that you test for Carbon Monoxide emissions regularly. Go to the Carbon Monoxide testing page. 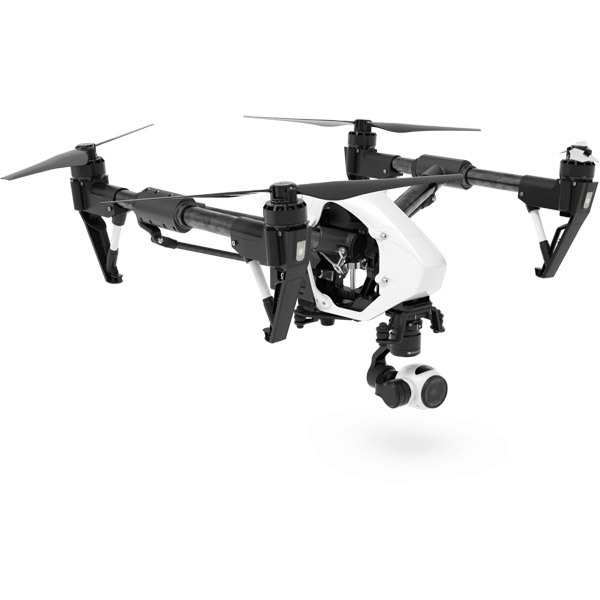 Unmanned aerial vehicles (drones) can inspect inaccessible roofs, buildings and assets. Fitted with a 4K-HD camera, our remotely piloted drones are capable of capturing high-definition evidence of defects in hard to see areas. Go to the Drone Inspections here. We conduct thorough house inspections and building inspections Melbourne wide. We are experienced licensed builders and qualified insured timber pest inspectors. Our building inspectors are professional, our reporting is comprehensive and most importantly we communicate to our clients with easy to understand terms. Documentation of all major and minor defects. Inspection undertaken by Registered Builders. Conducted in accordance with Australian Standard. Photos and clear description of defects. Presented in a well documented report. Accessing under the floor and inside the roof space. Conducted with the Termatrac T3i termite Radar. Melbourne House Check offers phone consultancy with an experienced builder. Whether you are building a deck, erecting a shed or renovating a bathroom, if you need assistance Melbourne House Check is available to help. Checks dangerous gas emissions from appliances in your home. Buying a house is expensive. From the down payment to the transfer fees to any improvement you want or need to make before you can move in, it stands to reason that purchasing a home is one of the more significant investments that the average person makes in their lifetime. In this maze of costs and steps, it’s all too easy to overlook or skip one of the most critical stages of the entire process: the building inspection. After all, the house looks perfect, and the buyer seems trustworthy. Why shouldn’t you trust them? Why shouldn’t you forego the inspection and use that money to cover improvements, furniture purchases or moving costs? As tempting as it might be to forget about the inspection and move forward with purchasing your home, there is a long list of reasons that you should rethink that strategy. Hiring a building inspector, in the grand scheme of things, is a small investment. If you have already decided that you can afford to buy a house, then paying for an inspection is probably not going to break the bank. In return for that investment, though, you will get something extremely valuable: peace of mind. The fact is that you can never be sure that a home is free of defects or problems. Yes, the previous owners might be perfectly lovely, and sure, the house might look flawless. However, even the most pristine looking homes can have flaws. There might be a crack in the foundation. The house could contain shoddy electrical work that is not compliant with building codes. There could be a termite infestation that you can’t see visual signs of yet because it’s in the early stages. You never know what’s hiding out of sight in a house. Hiring a building inspection company will tell you things that the naked eye can’t see and that sellers won’t typically reveal. At Melbourne House Check, we provide a building inspection service geared towards providing buyers with sound peace of mind. Before you commit to purchasing a house, and certainly before you put down any money, give us a call. We will check every aspect of the property, from the foundation to the roof, to ensure that it is structurally sound and fully compliant with all relevant building codes, regulations, and Australian Standards. If there are termites, electrical faults, foundation problems or other issues, you can trust that we will find them. Simply put, our building inspections in Melbourne are designed to help you make the correct decision before you buy a property. Again, purchasing a house is a significant investment and a momentous decision that will impact every facet of your life. Make sure you are fully informed by calling Melbourne House Check for an inspection before you buy. Building inspections – Our inspection considers all structural elements of the house, including the exterior, the interior, the roof exterior and roof space, the subfloor, any outbuildings and the entire site of the property. It documents all major and minor defects in a comprehensive and professional property report. Our building inspectors will conduct a thorough inspection on your property before giving you a comprehensive report. Pest inspections – Our timber pest inspections predominantly look for evidence of active termites, borer and fungal decay of timber, and we utilize state of the art termite detection equipment. Combined building and pest inspections – Our combined pre purchase building and pest inspection offers a comprehensive report of the condition of a house. It includes both property inspections and timber pest inspections all in one. Fully registered – We are fully registered building inspectors with years of experience conducting house inspections. 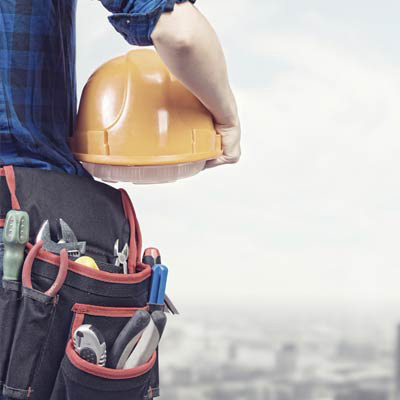 Fully insured – all building inspectors have both professional indemnity and public liability insurance. Australian Standard – our inspections are in accordance with the Australian Standard of Building Inspections. FAQ page – Our FAQ page will answer most of your questions. Social Media – For house inspection case studies follow us on Facebook, Twitter, Pinterest and Google+. FREE ongoing building advice – We offer FREE ongoing building advice for life, after you purchase the property that we have inspected. Please fill in the form below to request an inspection or call 1300 729 352 – 7am to 9pm / 7 days a week. House inspections, Property Inspections and Building Inspections Melbourne Wide. Buying a home is exciting, but for unwary buyers, overlooked defects can transform into unpleasant surprises soon after you move in. To avoid disappointment and the potentially massive cost of repairs, House Check Melbourne recommends looking past the aesthetic appeal of your new home and insisting on a pre-purchase inspection to check for signs of damage and defects before you buy. When you buy a house, it’s not just a roof over your head: a sound roof is vital for your happiness in your new home. When viewing a property, ask to borrow a ladder to inspect the roof if heights don’t make you giddy, or better yet, leave it up to the professionals at House Check Melbourne to do a thorough Melbourne house inspection on your behalf. For difficult-to-reach areas, House Check Melbourne can deploy a drone for a close-up inspection. When you make a booking for a Melbourne house inspection, we will look at every aspect of your new home to give you peace of mind and make sure the building complies with Australian codes and regulations. Within 24 hours of concluding our Melbourne house inspection, we will give you a comprehensive report including photographs to substantiate our findings.